McDonald's 4th National Breakfast Day: BEST MONDAY EVER! To get rid of the Monday blues, McDonald's offers its customers a reason to welcome the beginning of the week with bright smiles. 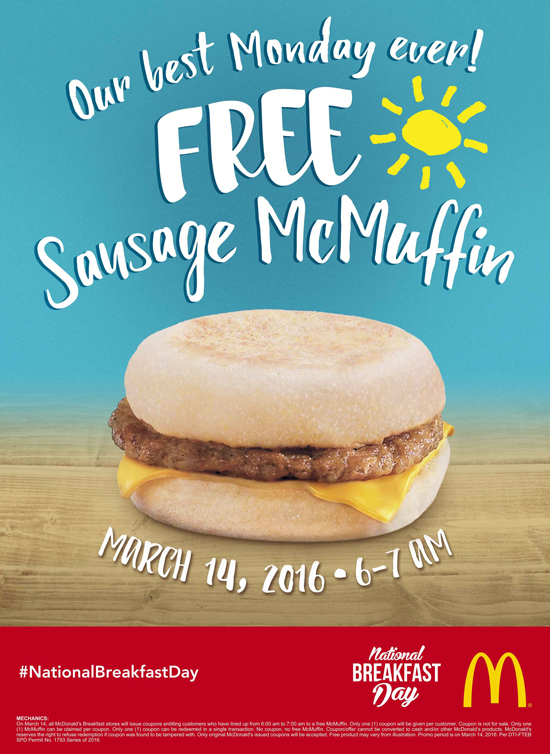 On March 14, more than 400 participating McDonald's breakfast restaurants nationwide will be giving away free McMuffins to customers from 6:00AM to 7:00AM. Each customer will be able to get his or her free McMuffin on a first-come-first-serve basis via dine-in, take-out, or drive-thru. "With the 4th National Breakfast Day, we want to remind Filipinos that at McDonald’s, they can have a great start to their day. It is our commitment at McDonald's to provide customers with a beautiful morning experience through our delicious and quality breakfast offers,” says Kenneth S. Yang, McDonald's Philippines President and Chief Executive Officer. McDonald’s turns the spotlight again to its McMuffin products. Made of a freshly cracked Grade A egg, lean Canadian bacon, melty American cheese in between perfectly toasted English Muffins, the Egg McMuffin is an iconic McDonald’s breakfast item loved all over the world. Not to be outdone, the Sausage McMuffin, a juicy and savory all-beef sausage with melty American cheese in between warm, perfectly toasted English Muffins, has also definitely become a breakfast favorite. Pumped up for your best Monday ever? Share your excitement on McDonald’s official Facebook page, facebook.com/McDo.ph, or tag @McDo_PH on Twitter and Instagram with the hashtag #NationalBreakfastDay. For more information on the 4th National Breakfast Day, visit www.mcdonalds.com.ph.